Manufacturer of a wide range of products which include ampoule filling sealing device, small scale ampoule sealing machine, single head ampoule sealing machine and double head ampoule sealing machine. We have high specialization in manufacturing and supplying superb quality Ampoule Filling Sealing Device. 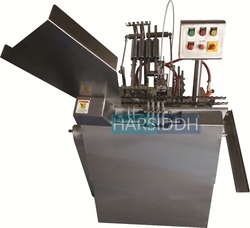 Our offered devices are well known for superb functionality and high production rate, hence have wide use in pharmaceutical industries for filling and sealing processes of ampoules. In addition to this, we make supply of these devices to our customers at affordable price tags in durable packaging. We are leading manufacturer and exporter of Small Scale Ampoule Sealing Machine and our product is made up of good quality. In order to design this device, our professionals use advanced machines and utilize quality tested materials procured from the authentic vendors. 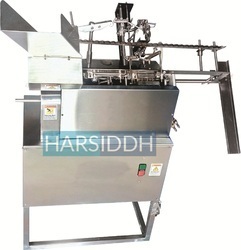 This device is used in industries like pharmaceutical, chemical, and food processing for filling free flowing powders, tablets, and capsules inside the glass containers. 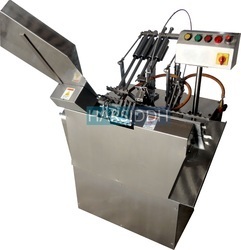 Our clients can avail this Small Scale Ampoule Sealing Machine from us at a reasonable price. The possibility of gas flushing before, during and after filling. Machine equipped with the pre-warming station.